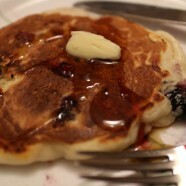 Hot, fluffy pancakes make a wonderful weekend breakfast, but it’s such a production for just you and your friend. You wind up trashing the kitchen and throwing out a bunch of leftover batter. This recipe is designed for two people. It makes just 6 pancakes and uses a single bowl. Buy a basket of blueberries next time you are in the market and stick them in the freezer. This recipe uses them frozen, so you can conveniently make these pancakes any time at all. Put the flour, baking powder, sugar and salt in a bowl and stir until mixed well. Add the milk, egg and butter and stir until mixed. The batter may be stiff and you might need to add a bit more milk to get it to the right consistency. Heat a large skillet or griddle over medium heat. Brush with butter or neutral oil (corn or grapeseed) and drop batter into skillet about 1/4 cup at a time (slightly less). Sprinkle a few frozen blueberries on top. Wait about 4 minutes for the pancakes to get bubbly and then set. Flip them over and cook for another 2 minutes or so. Serve with butter and maple syrup. Great recipe Rick! Thank you. In 2000 when Cheri and I were celebrating our 10th wedding anniversary we went to Banff, Canada and stayed at the Fairmont Chateau Lake Louise (http://www.fairmont.com/lake-louise/). One morning we went to the hotel restaurant for breakfast and I ordered pancakes. I told Cheri that they were the best pancakes I’d ever tasted! Convinced that I had been significantly influenced by the beautiful surroundings and the romantic weekend (and I had been) she declined when I offered her a taste. When I ordered pancakes again the next day and continued to rave about them, this time she decided to have a bite. She immediately agreed that these were indeed the best pancakes she’d ever tasted. We asked if the chef was available and she soon joined us at our table. Her secret was to use “some”, she never said exactly how much, malted flour in with the regular flour in her pancake mix. Since then we’ve experimented and we believe that a mixture of anywhere from 30/70 to 50/50 malted to regular tastes very, very good. Most often we buy Carbon’s Original Golden Malted Pancake and Waffle Flour (http://shop.goldenmalted.com/Original-Pancake-and-Waffle-Flour/p/GMI-GM&c=GoldenMalted@Flours) which is itself a mixture of malted and regular flour. 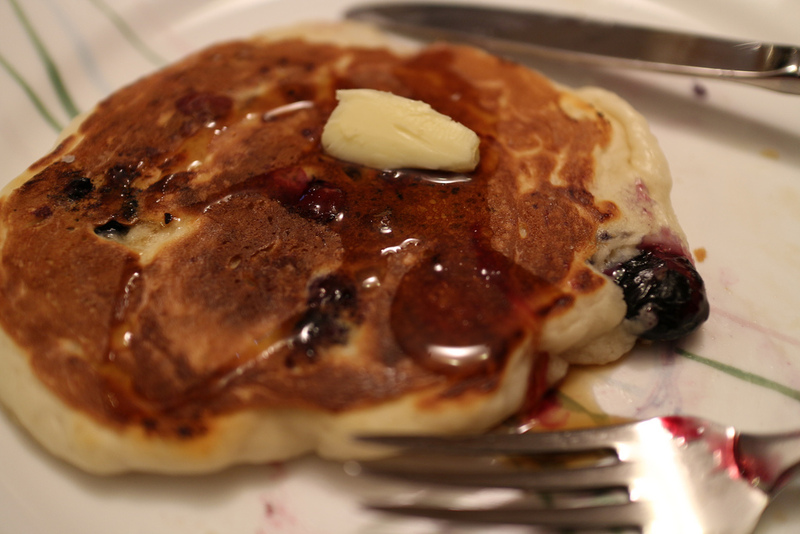 We heartily recommend you buy some and try it next time you feel like making pancakes. Hey, that’s great feedback. I’ll definitely try it out!